Releasing their new single with the collaborative effort of DREAM Records pop/orchestral artist Jonathan Thulin, SHINEBRIGHT have given us a new song with power, emotion, heart, and a catchy hook as the addition of Jonathan adds another layered dimension that makes this song possibly one of the catchiest songs I’ve heard this June/July. With Emily vocally reminding me of a combination of artists, from Alyssa Barlow of the now disbanded BarlowGirl, and Jodi from Love and the Outcome, to Britt Nicole and Dawn Michelle of Fireflight; SHINEBRIGHT give us a great reminder to be reckless, in the pursuit of love and to show love to those around us. The aptly titled “Reckless for Love” is as ambiguous as it is purposeful, and as Emily delivers what is on the surface a feel-good song that is certain to chart on mainstream radio, what is really in play is a song that encourages us to show love, God’s love, in every situation we are in. The layered vocals of Jonathan and Emily complement each other, and with Emily delving into the story behind the song, and how ‘…this song is about living and loving recklessly because that’s what Christ did for us, the kind of love Christ showed us is spontaneous and passionate…’; what’s not to like? The band also recorded a version without Jonathan as track 9- which version do you enjoy better? With the 9 track album consisting of 5 new tracks, 3 remixes and an alternate re-recording; SHINEBRIGHT have embraced the new season of a name change and transitioning into a duo with excitement, energy and passion as shown through these new tracks. “Closer to the Sun” encourages us to chase eternity with every chance we get, and using the sun as a metaphor of being close to God is nice, as we are reminded that Jesus is the only ‘sun’ we want to be close to (remember when you were learning in high school about Icarus and how he perished after wanting to be closer to the heavens…); while “Limitless” employs the use of electronic vocal distortion and a looping percussion, with the addition of New Zealand band Rapture Ruckus to deliver a theme of us conquering all the limits held before us as we long to touch and be in a place where the limits placed upon us are no more. With Emily channelling artists like Lady Gaga or Katy Perry, “Limitless” is a perfect song to be played in clubs or on the dance floor, and shows a new and interesting side to SHINEBRIGHT. “Spectacle of Light” employs orchestral and electronic instrumentation to deliver a Jonathan Thulin The White Room-esque atmosphere as SHINEBRIGHT delivers the theme of rebirth out of struggle that could almost be at home on Jonathan’s 2012 album (in fact, replace Emily’s voice with Jonathan and it could even be a radio single now! ); and “Only You”, the shortest song on the album, is the most relevant and poignant, as Emily shows us hauntingly refreshing and emotive lyrics and rhetorical questions of ‘…who can calm the storm and part the sea, who can make a miracle out of me? Only You…’ A song to declare from the rooftops that Christ is the one that we follow, this is a perfect title track, and though the song could’ve been a little longer, what Emily and SHINEBRIGHT conquer with the time given is a song that is catchy, and a song that is layered in truth. The band also deliver different and unique remixes of “Closer to the Sun”, “Limitless” and “Only You”, each showcasing a different side to the band and each remix enhancing the original versions and thereby making Only You an album/EP that stands out the most since Jason Gray’s Post Script. 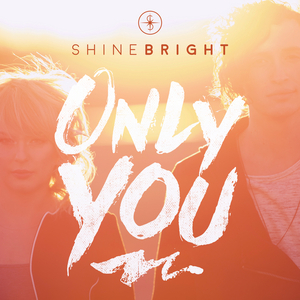 After a very successful 2013 label debut, SHINEBRIGHT and their coverage went quiet for a while. Nevertheless, what has resulted is a duo with a renewed and unique purpose, and just like fellow duos like Gungor, Love and the Outcome, All Sons and Daughters, The Sonflowerz, Capital Kings and The Vespers, SHINEBRIGHT has showcased the power of being in a group of two, and how the music that results is different to that of being on your own or even in a band. While the EP is a tad short, the energetic nature of each song and its remix makes up for it. The EDM/worship backdrop of the EP is unique and different, and something that’ll hopefully encourage listeners to take the plunge and give Only You a listen. Releasing the album on the same day as rejuvenated band The Neverclaim (their new album, based off their single, is a transitioning from country/CCM to pop/CCM), SHINEBRIGHT have showcased an album that is solid, and one of my July highlights. Well done to Emily and Nathan, for an enjoyable album and one to listen to again and again for months to come. Check out the new album streaming on NRT for this week- http://www.newreleasetoday.com/albumpreview.php Enjoy listening for a week. Let us know in the comments which songs are your favourites.